As I wind down my Streak for Mia in the month of May to raise awareness about pediatric stroke, I realize I haven’t yet written much about navigating the health care system, insurance, and out-of-pocket expenses. We are lucky in many ways. Our health insurance is excellent. We live in the Greater Boston area with its phenomenal health care services. I have enough room in my family budget to pay for expenses as they arise, to see a toy as potentially therapeutic and make the investment, to travel to other states to seek out special Feldenkrais practitioners. I am lucky to have a job and employer that have given me enough flexibility to attend all of Mia’s medical appointments and most of her therapy appointments. Many people who parent children with special needs, including stroke survivors, don’t have the same resources. I believe that for Mia, early diagnosis, treatment, and ongoing support have been critical to her recovery. One study estimates that in the year after a childhood stroke, medical expenses average $43,000. I haven’t taken the time to add up all of Mia’s medical expenses. Fortunately, I haven’t had to do that. Insurance covers most of it. I have made spreadsheets to track her appointments, to plan upcoming ones at a pace that is sustainable for our lives. I figured out early on that it was helpful to schedule one per week for a number of weeks in a row and then to have a break before the next round. In the early days, some of her doctors wanted to see her every 3 or 4 months. Having more than one appointment per week stressed our family schedule. Having weeks with no appointments was liberating and let us establish some normalcy. I also have spreadsheets that I have used to plan for and recover money from both health care and dependent care flexible spending accounts. The hardest financial battle I had to fight was with the flexible spending account administrator over Mia’s “participation fee” for Early Intervention services. The fee is based on family income and size. When she entered the program it was $250 for six months of participation. When she had about a year left in the program, it tripled to $750 for six months. I knew about the increase far enough in advance to allocate pretax money for it in my flexible spending account. I debated about whether to continue with these services or to switch to outpatient services through Spaulding Rehabilitation Hospital. There was no way that I could have gotten Mia to a weekly session of occupational therapy at one of the rehab hospitals. Early Intervention came to us at home or daycare. Logistics won over pure finances. A copay for one occupational therapy session is $20. So, even if we could go once a week, the copays for 26 outpatient therapy sessions would have been $520. I decided to stick with Early Intervention and pay the extra fees, counting on the flexible spending account to reduce the fee by using pretax dollars. I think it took three rounds of submitting the paperwork to finally get the reimbursement approved over a period of many months. They quibbled with it being called a “participation fee” even though they would have readily approved comparable outpatient expense of copays. I had to ask our Early Intervention liaison to make up different paperwork as justification. This was all very stressful. I can only imagine what others have to go through to justify insurance expenses routinely. We have traveled to New York City and to New Jersey for Mia to have intensive series of Feldenkrais lessons over a period of days from two different practitioners who are particularly gifted in working with children. These trips have been paid for entirely by me, thousands of dollars and worth every penny for the gains Mia made in those trips. My childcare expenses have also been impacted. Before this year, Zoe and Mia were both at the same daycare/preschool for the prior three years. When Mia was a little over a year old and Zoe was approaching four, a friend helped me realize that I needed more help as a full-time working single mom to two kids, one with special needs and extra appointments. So, in addition to two full-time daycare spots, I added a sitter three afternoons a week. Having another adult available to pick up my girls three days a week and to help with the crazy afternoon and evening routine helped tremendously. On the weeks when I had to take Mia to a late afternoon appointment, the sitter could pick up Zoe and play with her until we got home. A second sitter also came regularly on weekends for a four or five hour stretch to play with the girls so I could run errands or go exercise by myself or even just sit still and read a book. I gave myself a gift of four Thursday evenings out in the month of December 2011 with a sitter referred to me by a friend. After that, I kept her coming every other week for close to a year. While I really benefitted from having so much help, it was expensive to pay three different sitters hourly and a lot to manage logistically. This year, with Zoe and Mia in different schools for the first time, I switched from daycare plus multiple sitters to having an au pair. Mia still goes to the same preschool. Zoe is in public school for Kindergarten and the au pair is available to work up to 45 hours each week so I am not attempting to handle getting two kids to and from two different schools. I consistently take one evening off each week from kid-duty. This has made a huge difference in my life and sanity this year! It’s definitely the right childcare solution for our family for the next few years and gives me a lot more flexibility, some built in times for respite, and continuity of care for my girls. 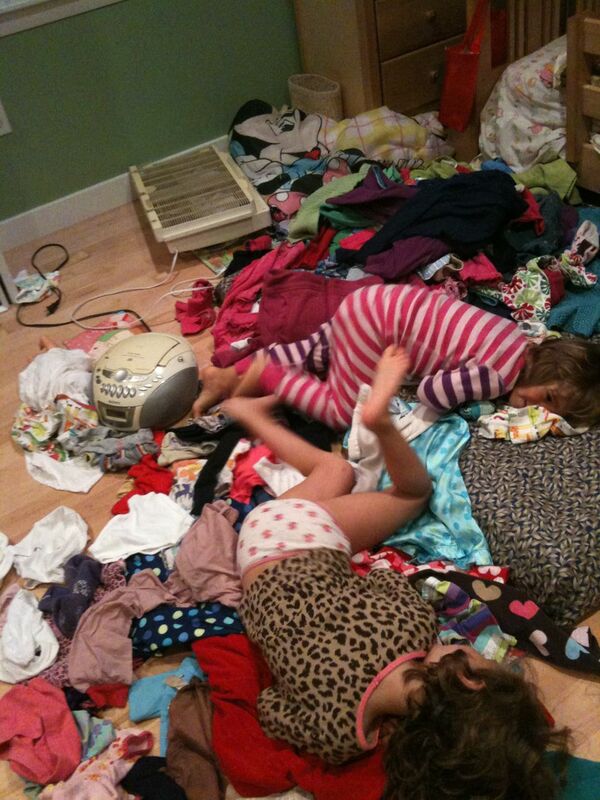 I’ll close this second-to-last post of the streak with a picture of just how crazy things can get around here. One night last fall, I was reading to Zoe in my room while Mia was playing in their room (too quietly). 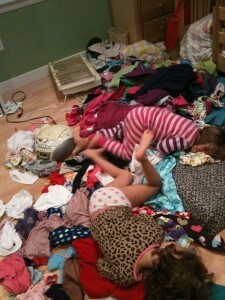 When Zoe and I went to investigate, we discovered that Mia had emptied every single item of clothing from her dresser. At moments like this, you can sit down and cry or laugh and go grab a camera. I chose the latter. This entry was posted in Pediatric Stroke Awareness Month 2013 and tagged au pair, Early Intervention, Feldenkrais, flexible spending, insurance, Mara, Mia, stroke, Zoe on May 30, 2013 by mara.